Unfair dismissal laws provide protection to Australian employees from having their jobs terminated in circumstances that are “harsh, unjust or unreasonable”. MKI Legal are experienced unfair dismissal lawyers in Perth. Our experienced workplace lawyers have provided legal advice on thousands of claims..
We wrote this article to give as much information as we can to employees all around Australia – so you know your legal rights. If you have been forced to resign, experienced a wrongful dismissal or you think it may happen soon, we understand that things may be a little difficult right now. You may be angry and confused. You may have a lot of questions. You may be wondering how you’re going to pay the bills, mortgage or the rent. You may also be worried about what people at work think about you and how you tell your friends and family that you lost your job. It’s important to remember that you are not alone. A lot of people have gone through this awful process of losing a job and have got through it okay. It’s important that you should find out whether your dismissal was fair and legal. If your dismissal was unlawful, then you need to know what your options are and what you can do about it. There are two main claims that employees can bring if they’ve been unfairly sacked. The first is called an unfair dismissal claim. The second is called a general protections claim – another type of claim that most people have not heard of. These two claims are generally available to employees in the national employment system (most employees in Australia are covered by the national system). Broadly speaking, employees in Western Australia are covered by the national employment system if they work for a ‘constitutional corporation’ which means a company engaging in business activities. 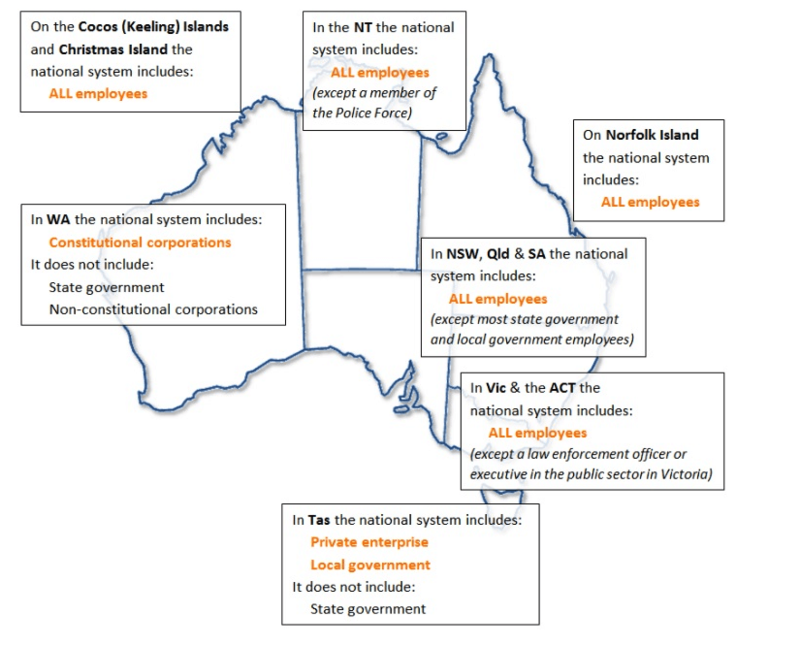 Here is a summary of all employees around Australia in the national system. For national system employees, there is a 21-day deadline to file either an unfair dismissal claim or a general protections claim at the Fair Work Commission. What does this 21-day deadline mean for you? The 21 days is calculated from the date that your dismissal takes effect. This generally means 21 days from your last day at work. If you were terminated while on annual leave or away from work, then it’s 21 days from when your notice came to an end. It’s important that your claim is lodged within this 21-day time limit because if it’s not filed in time, then you generally cannot proceed with the claim, and you’ll miss out on getting possible compensation. The time limits are strictly enforced. However, they can be extended provided there are special circumstances. Let’s discuss how unfair dismissal claims work first (then we’ll talk about general protections claims). Not everyone is able to lodge an unfair dismissal claim. To lodge an unfair dismissal claim, you need to tick a few boxes. You must be an employee. E.g a full-time, part-time or a casual who worked regular and systematic hours. Contractors are not eligible to claim unfair dismissal. You must satisfy the Minimum Service Test (specified below). You must satisfy the Income Test (specified below). You must satisfy the Dismissal Test (specified below). Your dismissal cannot be a genuine redundancy (further explained below). You must have worked for your employer for a minimum period of time. The minimum period of time depends on how many employees your employer had at the time of your dismissal. If your employer had 15 or more employees (including yourself) at the time of your dismissal, then your minimum period is six months. If your employer had 14 or fewer employees (including yourself) at the time of your dismissal, then the minimum period is 12 months. The number of employees is generally determined on a “headcount” basis, so all employees (whether full-time or part-time) are counted. Casuals are also counted if they are engaged on a regular and systematic basis. People who work for an “associated entity” of the business are also counted. If you’ve worked less than the above period you can’t lodge an unfair dismissal claim (but you may be able to lodge a general protections claim). be covered by an enterprise agreement. If you earned more than $145,400 excluding superannuation per year, then you cannot lodge an unfair dismissal claim unless you are covered by a modern award or an enterprise bargaining agreement (but you can lodge a general protections claims – see below). You need to be dismissed from your job to lodge an unfair dismissal claim. the employee resigned because the employee was forced to do so because of conduct engaged in by the business – in other words the employee had no choice but to resign. This is known as constructive dismissal. An employee has not been dismissed if they were demoted, provided the demotion did not involve a significant reduction in their remuneration or duties, and they remain employed by the same employer. A dismissal may occur if the demotion involves a significant reduction in duties or remuneration. An unfair dismissal claim will not succeed if the employee’s termination was due to a ‘genuine redundancy’. If you have not been made redundant this does not apply to you. the business of an associated entity of the employer. the remuneration which is offered. If you have been made redundant, but the business has not satisfied all of the above requirements of ‘genuine redundancy’, you are able to lodge an unfair dismissal claim — and chances are you’ll have a good claim. Your employer was required to discuss the redundancy with you (e.g. consult) before making you redundant – but did not do so. If you are eligible to make an unfair dismissal claim, what makes a dismissal unfair? There are certain conditions that are taken into account to determine if a dismissal was fair or not. We have created a summary below which goes through 8 of the common scenarios where the Commission has found that employees had been unfairly dismissed. If you were made redundant, your dismissal would be unfair if it was not a genuine redundancy (as explained above). · If you were covered by a modern award or an enterprise bargaining agreement, your employer didn’t properly discuss your redundancy with you before you were made redundant. If any of the above apply to you, chances are you were unfairly dismissed and could make a claim. Other people have done the same thing that you did but they weren’t dismissed. The thing that you did wrong wasn’t serious enough to warrant termination of your employment. In other words, even if you did something wrong, it would have been more appropriate to give you a letter of warning instead of dismissing you. If you didn’t do anything wrong but you have been falsely accused of doing something wrong. If you did something wrong, but you were not aware that you could have been terminated for it. For example, if there is a workplace policy that says that if you fail a breath test on-site, your employment could be dismissed, that would be a fair dismissal because the policy expressly stated, if you do X, you could be dismissed. However, if a policy doesn’t expressly state that your employment could be dismissed if you do something wrong, then you could argue that your dismissal was unfair. With this section, it is important to remember that these wrongdoings do not apply to wrongdoings related to your performance of your job. If you were terminated because of the way you did your job, that is a performance issue and dealt with in the category below. · You weren’t given a reasonable opportunity to improve before you were dismissed. Usually, a reasonable opportunity involves being placed on a performance management plan, being told how you’re underperforming and being given a chance to improve. · Your employer was wrong — you did do your job properly, and the accusation of poor performance was wrong. At law, this is known as being unable to perform the inherent requirements of the job. For example, if an employee breaks a leg and they are unable to work in a building site which requires them to climb scaffolding, then that person cannot perform an inherent requirement of the job. Being dismissed for not performing the inherent requirements of the job can be legally complex. Your dismissal would be unfair if you could perform the key requirements of the job despite your injury or illness. If you were on temporary sick leave and were on sick leave for less than three months in a 12 month period, and were dismissed for being unable to perform the inherent requirements of the job, then your dismissal could be unfair. You could also have a general protections claim (which we discuss further below). If you were dismissed for something you allegedly did wrong or for allegedly not performing your job properly, and you were not given a chance to respond to those allegations before you were dismissed, your dismissal would be unfair. The reason for this is because you weren’t afforded procedural fairness. Procedural fairness at law means that an employee must have a chance to have their say regarding the allegations against them so the business could make an informed decision before the employee is terminated. Usually, when a business tries to terminate an employee, the normal process is to have a meeting about the allegations against them and let the employee have their say. At this meeting, an employee has the right to have a support person present. A support person is someone who sits at the meeting and emotionally supports the employee. A support person does not talk on the employee’s behalf but is there only in a supportive role. If an employee has asked for a support person to be present at these meetings (a meeting which could lead to the employee’s dismissal), and the business says no without any good reason, that would mean the employee was unfairly dismissed. If you were dismissed out of the blue and you had no idea why you were dismissed, chances are your dismissal was unfair. This is because businesses need to have a valid reason to terminate an employee’s employment. If you were terminated for no reason at all, chances are there was no valid reason for the dismissal. Also, your employer didn’t given you procedural fairness like they are required to do (see above), so you would likely have a good unfair dismissal claim. If you had no choice but to resign because of the behaviour of your employer, then at law you’ve been ‘constructively dismissed’ and you’ll have an unfair dismissal claim. To establish that you were ‘constructively dismissed’, you need to show that you had no other option at all but resignation. If there were other things you could have done other than resigning, then you were not constructively dismissed’ and you won’t be able to make an unfair dismissal claim. If any of the above apply to you, and you meet the unfair dismissal criteria, then you may have a good unfair dismissal claim. Contact us for a free discussion about what to do next. A lot of people have heard of unfair dismissal, but did you know there is another type of claim you can make with is equally good as unfair dismissal – or maybe even better. It’s called a general protections claim. A general protections claim can be made by any employee no matter how long they’ve been working at the job and no matter how much they earn. The basis of a general protections claim involves investigating the real reason why you were dismissed from your job. If the real reason involved the 18 reasons specified below (even if your employer alleged something different), then you could have a good general protections claim. It doesn’t matter if your employer gave you another reason for your termination such as being made redundant, or not performing, or engaging in some misconduct. What matters is the Court determining if your employment ended for any of the 18 unlawful reasons in the summary below. When determining what was the reason for your dismissal, you need to ask yourself who decided to terminate your employment and if that person was aware or had knowledge of the unlawful reason mentioned below. If they did, then it is possible that your employment could have ended for those unlawful reasons. If, however, the person who decided to terminate your employment didn’t have knowledge of the unlawful reasons mentioned below, then it would not be possible for your employment to be terminated for those reasons. You cannot be fired for making a complaint about your employment. The complaint can be in writing or it can be verbal. It can be formal or informal. For example, making a complaint about bullying, work pressure, unfair treatment, your pay, or anything at all as long as it’s connected to your employment. You cannot be dismissed for enquiring about anything related to your employment. It can be anything such as a request for payslips, enquiring about whether you’re being paid correctly, or enquiring about whether super has been paid. You are free to make a complaint to government bodies such as the ATO or WorkSafe, or any other body that regulates employment matters. If you participated in a workplace process or proceedings such as giving evidence in an unfair dismissal claim that someone else has lodged or lodging a bullying claim of your own or lodging another claim for unpaid wages — you cannot be fired because of that. For example taking annual leave, taking sick leave, taking compassionate leave, requesting flexible work arrangements or going on a parental leave. It means you cannot be fired for exercising your lawful employment rights. If you are sick or injured, you cannot be dismissed lawfully unless you have been on unpaid sick leave for more than three months in a 12-month period. It’s important to remember that the three-month rule only applies to unpaid sick leave. If you take any paid sick leave, that is not counted in this three months period. You are free to decide if you want to join a union or not, and that decision cannot be taken into account as a reason to terminate you. This refers to the colour of your skin, your historical identity or ethnic origins. Whether by birth or by self-identification, an employer can’t dismiss you based on your citizenship or place of birth — unless that same status makes you legally ineligible to work in Australia (for example a foreign citizen without the correct visa). This means gender identity, including those who identify as transgender or gender neutral. You can’t be dismissed because of your age. For example married, single, widowed, divorced, or separated. You are protected against dismissal if you are pregnant, you discuss the desire to become pregnant or even think you are pregnant (and aren’t). An employer cannot dismiss you if you have children who are dependent on you. Unless it prohibits you from fulfilling core job functions, physical or mental disability cannot be grounds for dismissal. This is a wide category that includes things such as native tongue, social class or local heritage. You are free to be a member of any political party and express any political opinions without fear of dismissal. Your employer cannot dismiss you based on your religion, unless you are employed at a religious organisation that follows a certain creed and you do not adhere to that creed (e.g.at a Catholic school). How do I know what the true reason for my dismissal was? A lot of people ask that question, It’s a good question because you cannot never truly know what your employer was thinking when they fired you. However, thankfully the law has a solution for this. When it comes to general protections claims, all the employee needs to do is raise a little bit of evidence to satisfy the Court that they could have been dismissed for that unlawful reason. Then, what the Court does is make a presumption that the employee was dismissed because of that unlawful reason – and the employer needs to convince the Court that they did not take that reason into account when they dismissed the employee. In other words, provided there is a little bit of evidence, the employer is presumed guilty (if we can use that word) unless they prove they are innocent. So, for example, if you make a complaint of being bullied at work, and you’re fired very shortly after that, then you’ve got enough evidence to satisfy the Court that there is good reason for you to make the allegation that you were dismissed because of the complaint. The employer would then need to convince the judge that they did not dismiss you for anything to do with that complaint. If the employer cannot convince the judge, then you win the general protections claim. It’s also important to remember that an employee can win a general protections claim even if the unlawful reason in not the entire reason for their dismissal. As long as the unlawful reason forms a part of the reason why the employer fired the employee, that is enough for the employee to win. If you lodge an unfair dismissal claim, the maximum you can get is six months lost wages/salary. What the Court will do is look at how long you’ve been unemployed for and generally compensate you for the period that you were unemployed. Plus if you find a new job at lower pay, the Court will generally give you the difference between the salary of your old job (with the higher salary) and the new job with a lower wage or salary. In unfair dismissal claims, you generally cannot claim anything for depression, anxiety, or stress. Three months’ wages/salary based on your old job PLUS a further three months’ of the difference (e.g. the difference is $1,000 per month multiplied by three months). Having said that, the maximum amount is not automatically given – but that is a rough way of calculating your compensation entitlements. Other factors do influence it though. Any redundancy pay or notice paid-out (e.g. you didn’t work your notice but were paid it out in lump sum) is deducted from your compensation. Also the maximum compensation the Commission can award for an unfair dismissal claim is $72,700. If you lodge a general protections claim and you are successful, then the amount of financial compensation you can get will usually be higher than an unfair dismissal claim. There is no maximum compensation in general protections claims. You could get compensation for the equivalent of the lost income you suffered while you were unemployed. If you find a job at lower pay, you can also claim the difference between the lower salary/wages in the new job compared to the higher salary or wages in the old job. The Court will need to decide how long you would have stayed employed with your employer when making an assessment for lost income. In general protections claims, you can also claim compensation for depression, anxiety, or humiliation you’ve suffered as a result of the dismissal. With this claim, the Court will also impose a penalty against the employer for breaching the general protections provisions. A penalty cannot be imposed in an unfair dismissal claim. That penalty can be tens of thousands of dollars and can be paid to the employee. In general protection claims and unfair dismissal claims, each party generally pays their own legal fees. That is a good thing for employees because you can commence a claim against your employer without fear that you will have to pay your employer’s legal costs if you lose. The only way someone could be liable for paying the other party’s legal fees is if they commence a claim that is vexatious or has absolutely no merit. Generally speaking, it is rare for the Court to make anyone pay the other party’s legal costs. But how does compensation work in reality? In reality, the vast majority of unfair dismissal claims and general protections claims are settled before they go to trial. There are thousands of claims lodged every year and the system is structured in such a way that the Court forces the employer and employee into compulsory mediation. Claims are, in the vast majority of cases, settled at forced mediations. Most mediations are done by phone, so you don’t need to see your former employer in person. Mediation is usually where compensation pay-outs are negotiated. Obviously, because the claim is being settled without going to trial both parties usually make concessions to resolve it – so employees don’t get everything they want or the maximum but usually a lower amount to resolve it without going to hearing. Like they say, a bird in the hand is worth two in the bush. What Else Can I Get Beside Money? Financial compensation to the employee. A statement of service given to the employee to make it easier for them to find a new job. Confidentiality obligations to ensure that the employee’s dismissal is kept quiet and not revealed to anyone else by the employer. The dismissal be changed to resignation. This means that the employee can say they resigned from their employment instead of being fired. This makes it easier for them to find another job. Non-disparagement provisions. This is a legal term to state that both the employer and the employee agree not to say anything negative about the other party. This helps protect your reputation knowing that your good name would not be slandered by the employer. We find that this is a good way of resolving the dismissal claim and allows the employee to move on with their life. With an unfair dismissal claim, an employee must file a Form F2 with the Fair Work Commission within 21 days from their last day at work. Within seven days of the claim being filed, the employer files a response to the claim. After that, the parties attend a telephone mediation at the Fair Work Commission. A conciliator runs the mediation, which usually lasts for two hours. That is where most claims settle, and if that happens, that’s the end of it. If the claim cannot be settled, then it progresses to a hearing. The mediation is usually set within six weeks of the claim being filed. The mediation can be done by phone, and you only have to give up about half a day of your time to attend the mediation. With general protections claims, the process is a little different. The first step involves lodging a claim with the Fair Work Commission (Form F8). The employer will then file a response to the claim within seven days. Then, the parties will attend a telephone mediation in the Fair Work Commission (the same way as an unfair dismissal claim). If the claim settles, that’s the end of it. If the claim does not settle at the Fair Work Commission mediation, the next step generally is for the employee to file their general protections claim at the Federal Circuit Court or Federal Court within 14 days of the Fair Work Commission formally terminating the mediation. Once the general protections claim is in the Federal Circuit Court, in Western Australia, the claim normally progresses to a second mediation. This mediation is done in person and there are high success rates of matters settling at this stage. If the matter cannot settle at the second mediation, then it is programmed to a trial. The reality is that it is easier for both the employee and the employer to settle the claim at the mediation than go to trial. If There Is No Settlement (unlikely as vast majority settle)? If the claim does not settle at the mediation, then the employee generally has the option to withdraw their claim or take it to trial. If the employee withdraws, there is usually no cost risk (provided it’s done quite quickly after the mediation). This means that employees who are scared of the court process can lodge their claim, go to mediation, and try to get a resolution. If it resolves, great – they’ll get some financial compensation and other benefits. If it doesn’t resolve, the employee can just withdraw their claim without proceeding to the trial part. And the employee can proceed to trial if they want too. What Sort of Evidence Do I Need? When it comes to evidence, we understand that you may not have access to work emails anymore. You may also not have access to your former colleagues who still work there. Initially, before mediation, your version of events is enough evidence. If you can give evidence as to what you saw and what you heard, that is enough evidence for the purpose of lodging your claim and running with it to mediation. You don’t need anything more. After we file your claim, if it turns out that we need access to your work emails or any other documents the employer has, we can request them. If the employer does not provide access to these documents, there is a process where we can compel the employer to disclose those documents. You don’t need to worry if you don’t have all the evidence now. If you can tell us what happened and how it happened, that is enough to lodge your claim. Can I Get My Job Back? Yes, it is possible to get your job back, but it is rarely done. Once an employee is dismissed, it is difficult for the employee to go back to their old job. It is also difficult for the employer to accept the employee back into the organisation. In rare cases, the employee is given their job back – at law, this is known as reinstatement, but most of the time, an employee who succeeds in an unfair dismissal or general protections claim is given financial compensation instead of their job back. Does My Dismissal Need to Be in Writing? No, you can be dismissed verbally. Generally speaking, most employers will put the dismissal in writing by providing the employee with a termination letter. If you were not given a termination letter, you can still lodge an unfair dismissal or general protections claim, provided you have been dismissed. I’ve Just Lost My Job – What Should I do? Things may be a little raw if you’ve lost your job recently. Once you have healed, you should try and get a new job as soon as you can. If you don’t try to find new employment, without a good excuse, then the Court can reduce the amount of compensation you get. The best thing you can do is not to waste any time, because you only have 21 days to act and that can go fast. We recommend you give our office a call and we will have a free discussion with you to see if there is a potential unfair dismissal claim or general protections claim you can make. If there is a potential claim you can make once you discuss it with us on the phone, you can have a meeting with one of our lawyers to go through your claim in detail and for us to tell you how strong your claim is. Contact us for a free discussion today. You have nothing to lose by making the call.